Here are two fascinating essay series written by Allen L. Barker between 2001 and 2003. 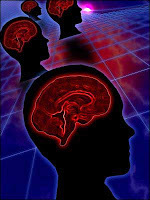 Part 1: Motives for Mind Control, June 13, 2001, "describes some of the motives for mind control and why it continues." Part 2: Resisting the Mind Control State, April 29, 2001, offers "methods to resist governmentally and societally supported mind control torture, repression, and exploitation." Part 3: Mental Firewalls, February 17, 2002, "deals with the techniques and methods that survivors of this torture have developed to resist having their very mentation tampered with, their bodies and lives violated, and their minds turned into battlefields." Part 1: Models of Synthetic Telepathy, July 31, 2002. Part 2: Acoustic Signal Modulation, August 19, 2002. Part 3: Working Models, September 15, 2002. Part 4: Bayesian Stopping Criterion, March 22, 2003.